Future50 is an exciting new business growth programme that’s designed to recognise Norfolk and Suffolk’s most innovative companies. We’re finding the region’s ‘ones to watch’ and supporting them to accelerate their growth ambitions through high quality business advice, inspirational networking events that stimulate peer learning, innovative multimedia business support and access to grant funding as an investment catalyst. Future50 members are be the individuals and companies that are creating jobs, growing at a faster rate than others and that have the drive and ambition needed to be leaders in their sector. On 26 June, we celebrated the newest cohort of Future50 Members, at OrbisEnergy in Lowestoft. These businesses join the companies welcomed into Future last November. We caught up with some of those businesses to see how Future50 has helped them so far. It was in the middle of the recession in 2010 when Adam Soall spotted a gap in the market for low cost removals. With a variety of career experiences and Adam’s passion and drive to succeed, Loads4Less was born. The business is much more than a simple A to B transport business. It provides house removals, UK and European deliveries, shipping, packing, storage and furniture recycling. Adam has built foundations on attempting to get everything right first time. He sources professional operational staff who are focused on customer service. Adam also attempts to carefully coordinate jobs to save on carbon emissions and enables savings to be passed onto his customers. The business also offers an hourly rate on local moves to allow customers to exactly manage their removal needs. A close relationship with Big Yellow Storage group, which has 86 stores nationwide, can also be a great help for his customers. The business, which employs 12-15 staff based on seasonality, has been recognized in 2012 Best of Norwich award for being liked, a bronze winner for the Scoot awards and in 2015 was acknowledged as an innovative, growing, investing business in Norfolk with membership to Future50. Through networking at Future50 functions, Adam has agreed a deal with Naked Wines which has improved the offering his customers enjoy with using Loads4Less. He is also indebted to his team. He believes could not have achieved the success without them. “Having an energetic and passionate team are crucial to our business and the success we have achieved” Adam comments. 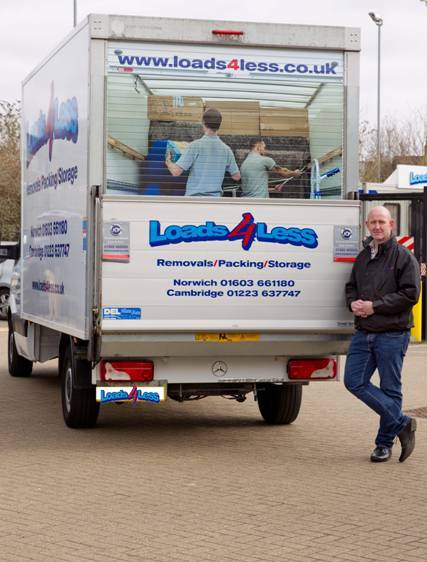 Loads4Less continues to go from strength to strength and Adam has recently formed a relationship with the charity EACH (East Anglia’s Children’s Hospice) by donating furniture. Having set a conservative target of raising 10k in three years, the charity’s sales have already tripled in the first two weeks of the scheme and benefited to the sum of £1,100. Adam has learnt a huge amount from running a business that he feels so passionate about. He says although it can be stressful at times, there are so many highlights, such as developing his team, making new contacts and developing both as a business and an individual. His plans for the future include expanding nationwide and he hopes to have eight locations within the next two to three years. From a young age Simon Budd has always wanted to follow in his father’s footsteps and set up his own business. Studying Business Decision Analysis at University fueled his passion and following a time working in banking in London, he decided to give something back and moved to working for a housing association charity. It was here, supported and assisted by his wife, that he had the idea for his own business. Norfolk-based Lifeline24 sells personal alarms to people who are elderly, frail or disabled within the UK and Ireland. They provide the life-saving equipment to their customers on monthly, annual or lifetime plans, as well as providing them with 24 hour help at the push of a button. Lifeline24 started trading as a family business in February 2014 and has since seen a huge amount of success in the UK and Ireland. In the space of one year, they have increased their staff team from 3 to 30 and now have a marketing department, customer service team, IT specialists, a web developer, project management team, an administration department and a dispatch team. They moved into their own premises in November 2014. Simon is full of enthusiasm about running his own business. “There have certainly been lots of ups and downs so far however the positives definitely outweigh the negatives.” He says. “The team at Lifeline really are the best. Each person has their own strengths and we all gel together so well. It’s a really nice environment – a very relaxed yet professional place of work. Lifeline24 is a member of the Telecare Services Association and are very proud to have been recognized as one of the Startups 100 – the UK’s rising start-ups set for explosive growth. If you’d like to learn more about the Future50 programme, head here. If you’d like to learn more about becoming your own boss, speak to Nwes today.